Don’t know how to update your payment information or how to change your credit card on iTunes? Then follow this post to change credit card on iTunes in two simple ways. Give this all-in-one iOS data management software a try, and it would help you to transfer your iTunes purchases and other iPhone/iPad/iPod among iDevices, computers and iTunes library easily. The credit card assigned to your Apple ID is very important, because all your purchases activities in iTunes Store, App Store and iBooks Store are charged from it. And if there are something happened to your credit card, such as it got stolen or you just received a new one, update your Apple iTunes payment information is undoubtedly necessary. And here, this post will introduce two simple ways to help you change credit card on iTunes in case you are not clear about how to make it. Method 1. Change Credit Card on iTunes on iPhone. Changing your iTunes credit card on iPhone directly is just as easy as ABC. If you do not know how to make it, just follow the detailed steps below. 1. Tap Settings on the Home screen > Tap iTunes & App Store. 2. Tap your Apple ID at the top of the screen and select View Apple ID from the pop-up screen > Sign into your account when prompted to do so. 4. In the screen that opens edit credit card and address information > Tap Done. Method 2. Change Credit Card on iTunes on Computer. If you prefer to change credit card on iTunes on your computer, it’s also not that complicated as you imagined. And just follow the detailed steps below you can change your credit card on iTunes on your computer successfully. 1. Open iTunes on your computer and sign in with your Apple ID. 2. Click the Account >View My Account > Enter your password > Press Return. You can also change your billing address at the same time. And after you finish that, the new credit card will be charged next time when you buing things. After getting the simple methods we list above on how to change iTunes credit card, you can make it successfully. 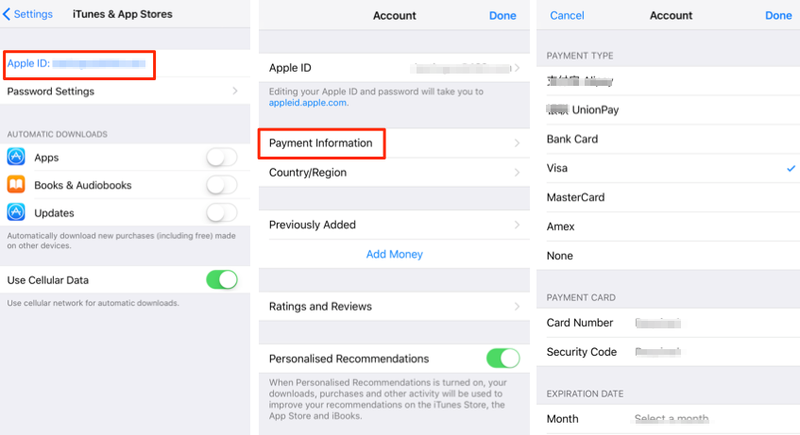 Moreover, if you don’t want to use credit card for payment, there is also the method to help you create an iTunes Account without a credit card.